Starlight Children’s Foundation is a charitable organization dedicated to helping children cope with serious illnesses. Less a medical support and more an emotional one, Starlight helps kids deal with the psychological toll sickness and hospitalization can bring. Rethink wanted to help the Foundation do what they do best. The kids they work with range in ages from toddlers to teens. It was the latter group that the team was especially intrigued by. The incredible vulnerability of really young children means that – thankfully – there are many sources of help for babies and young kids facing medical issues. And while teens receive help as well, they’re a little less likely to be the centre of attention than the youngest patients in a hospital. Kids with serious illnesses who are hospitalized for long term stays have a lot to cope with. For young teens especially, their sense of identity is a challenge. Teens described how the hospital experience makes them feel as though they’re “just a hospital patient,” and that who they are becomes lost in the process of their treatments. Although it’s less serious than the physical ailments their doctors and nurses are helping them with, it’s very real to them. Having to face the world in drab, anonymous hospital gowns makes many teens (whose identities are still developing) feel diminished. For many, lots of poking and prodding and constant examinations make it feel like people see them as an illness, not a person. 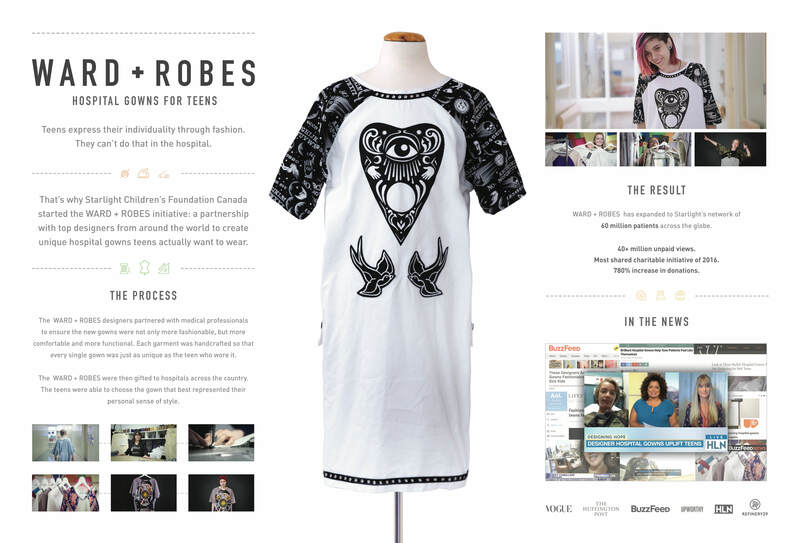 Starlight Children’s Foundation and Rethink teamed up with Canadian designers to develop a line of one-of-a-kind hospital gowns packed with personality. The designers ranged from a tattoo artist to a high-end fashion designer who had once worked with David Bowie. While maintaining the functionality of the gowns, the designers worked with lively, colourful fabrics and custom touches that transformed the garments. Ranging from camouflage and punk-inspired looks to lace and hipster styles, the team took the gowns to hospitals and let kids choose whatever “outfit” they wanted. The minute they put the gowns on, they lit up. As one teen said, “It feels like I’m myself. It doesn’t feel like I’m in a hospital anymore.” The experience was filmed, and spread across the world through social media. The Ward+Robes initiative earned attention globally and garnered more than 22 million unpaid views, resulting in a 780% increase in donations to the Starlight Children’s Foundation. It received coverage from hundreds of publications including CNN, Huffington Post, BuzzFeed, and Teen Vogue. It also caught the attention of medical professionals around the world and Starlight Foundation is now expanding the program to their network of 130 hospitals worldwide.